An exercise in futility. That is what many would call this endeavor. How few elements (signifiers and affordances) do you need to not only recognize a game for what it is, but also are able to play it? It turns out that you only need very little to do very much. o, what do you need to make the 1D Pong game? Input You need to have some input device. Buttons are some of the simplest of input devices that simply indicate “here you can press”. For the adventurous, you simply press a button and see what happens. The conservative requires more information and needs to see a button in relation. The positioning of the buttons must direct you, in some fashion, that it is related to what is found around it. Placing the buttons next to an LED should signify that its function will relate to that LED. Course What is the minimum of lights you need to hit from A to B? The absolute minimum could be two. However, that could cause confusion. For example, it may indicate that the light only belongs to the button. So, three would be a better option. Three would make a line, have symmetry and make bouncing more natural. However, the time it takes to get from A to B and the other way around would be really fast. The gameplay needs to have some temporal spacing for the player to adapt and react. Therefore, five lights would be a practical minimum to preserve symmetry and have good temporal separation. Feedback Every system you operate requires some kind of feedback. Without it you’d never know whether or not something happened. There are already buttons. You know that you pressed one when it gives you the feel of being operated. Once you press, you also want to experience a response to your action. If you do not notice a response, then you probably pressed the wrong button. Responses can be visual or auditive. Note that a tactile response to a button does not say that the operation succeeded because it is associated only with the action of pressing the button, not the response to that action. An auditive feedback for the gameplay can be used to indicate that you hit or missed the ball. It also can indicate the movement of the ball. The movement of the ball is conveyed visually by the movement of lights on the line (it is the premise of the game). Feedback is guaranteed by using tactile buttons, a buzzer that can generate sound and the LEDs that blink in a specific order. That means a total of 8 I/O pins on a microcontroller. That is too much! 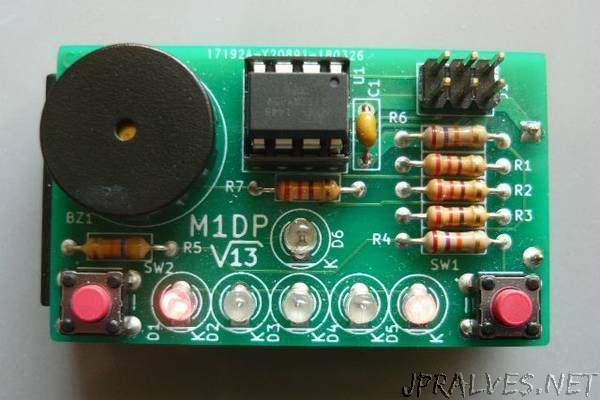 A design of minimalism should use a very small microcontroller and that is one having 6 or 8 physical pins. Subtracting two pins for the power supply leaves 4 or 6 I/O pins.